Have you ever been just writing along in Microsoft Word, and then right before your eyes, you watch your words disappear? I have. More than once. Most of the time it was when I was writing some insidious opinion on Obama, or Clintons, or the Bushes. The journalist Luke Harding’s book, The Snowden Files, came out earlier this month. But judging by Mr. Harding’s assertion that his words were somehow deleting themselves while he wrote about the NSA, it’s a wonder it came out at all. While he was working on the book about Edward Snowden’s exploits, Mr. Harding writes in the Guardian, the sentences he wrote about the NSA would periodically garble or delete themselves. Something odd happened. The paragraph I had just written began to self-delete. The cursor moved rapidly from the left, gobbling text. I watched my words vanish. When I tried to close my OpenOffice file the keyboard began flashing and bleeping. Over the next few weeks these incidents of remote deletion happened several times. There was no fixed pattern but it tended to occur when I wrote disparagingly of the NSA. All authors expect criticism. But criticism before publication by an anonymous, divine third party is something novel. I began to leave notes for my secret reader. I tried to be polite, but irritation crept in. Once I wrote: “Good morning. I don’t mind you reading my manuscript – you’re doing so already – but I’d be grateful if you don’t delete it. Thank you.” There was no reply. A month later the mysterious reader – him, her, they? – abruptly disappeared. I do still have one reader there according to my stats. But, I’m not special in any way. I happen to believe the government has a dossier on every “patriotic” American, and it’s no conspiracy when Homeland Security even lists us as a threat. So why try to discourage lowly bloggers? Or anyone for that matter? 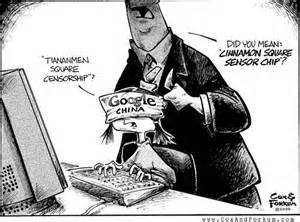 Basically, it’s a form of censorship. And now that Obama has given the internet to the world, something, which by the way, he had NO authority to do, this kind of thing will become the norm. Wait till China and Russia put their two cents in. 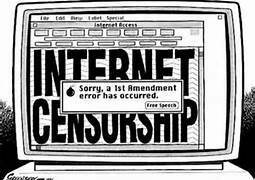 The truth is, the liberals have been desperate to silence the internet for many years because it really is the last place that the normal citizen’s voice can be heard. 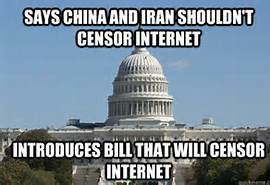 If you think our government does NOT want to censure us…look at what the I.R.S. did to the Tea Party groups. Let’s go back: Remember the E-PARASITE legislation, a bill proposed by Congress that was formerly known as the Senate-backed PROTECT IP Act? It was intended to punish copyright infringement–as well as toy with its definitions to a harrowing degree. Websites would be guilty until proven innocent. Search engines would punish you to the dustbin of the superinternet basement. Obama’s FCC Diversity Czar, Mark Lloyd was on record for praising Hugo Chavez for shutting down private media companies. But go figure: the big boys love it: Google, Zuckerface, Verizon, AT&T, and Senate Commerce Committee Chairman Jay Rockefeller argued that the transition will help ensure the Internet remains free and open. Right…if Mr. One World Government thinks it’s a good idea, that should make us all feel better. For now, we might be safe. But AFTER the next elections…I wonder. My friends amforatas in Australia thinks that the internet will always be free…that the internet will change the world, and no government will be able to control it. I hope he’s right, because as much as Hillary Clinton and Obama stand up and give great speeches about ‘freedom of speech’ it’s all a ruse. They mean…and want..to control it all. We’ve seen the internet crushed by dictators in other countries, could it happen here? The FCC is directly interfering with our free market system, by giving bureaucrats power over Internet carriers. The Net Neutrality Act seems to be part of a larger effort by the Obama administration to exert power and speech restrictions over the entirety of the Internet, what you can see when you are on it, and how you access it. However, what we have today is a fundamentally broken system that funnels most of the wealth and most of the power into the hands of the ultra-wealthy and the gigantic corporations that they own.